After Death is quite simply one of the most beautiful things I’ve read this year, both in writing and in visuals. It has an emotional resonance that I would almost liken to a Fabio Moon/Gabriel Ba collaboration, and please take that statement with the gravitas it deserves. 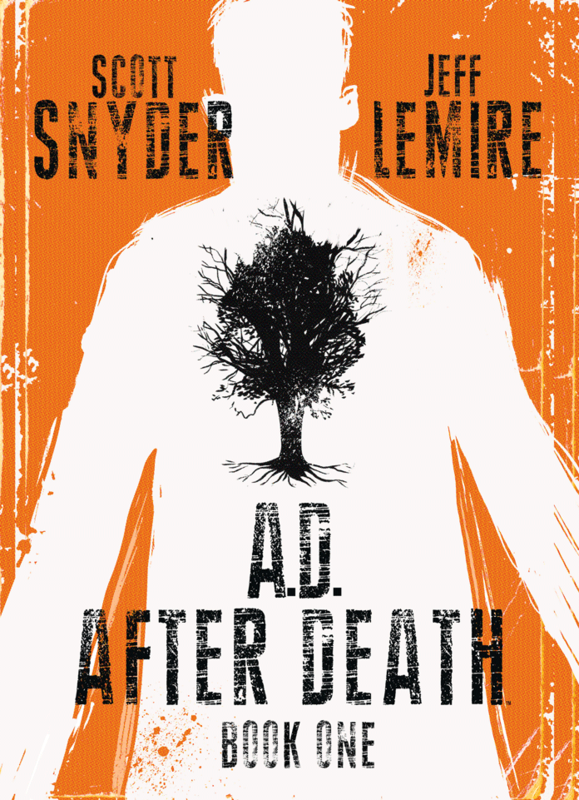 Anything that has Scott Snyder and Jeff Lemire attached to it should have your full attention, as there probably isn’t any other two people in the industry right now producing content of such brilliance. Both are enjoying purple patches, and even the suggestion of a collaboration between the two should have the world of comic book fans rapturous attention. In many ways this is not the Scott Snyder we know, the style of the writing seems to be outside that of his previous content. Such was the descriptive prose of the first half of the issue I almost felt I was reading American contemporary lit, like I was reading On the Road, or One Flew Over the Cuckoo’s nest again. It was unexpected, but by no means unwelcome. The style of the writing, and the graphical presentation of it I found delightful. As I mentioned, the issue is very much in two sections, one ‘before death,’ and one ‘after death,’ with a small section in the ‘now.’ Thematically they are all very different, the most obvious cue to determine where in the story we are is the typeface used. When the character recites his past the font is in old courier typeface, like a book or recollection, but the alignment changes constantly, like a reflection of memory. Not only is this pleasing to the eye, the diction Scott uses, indeed the stories and recollections of the main character of his family are just lovely, it’s these seemingly innocuous details that start to pull on the readers heart strings. It really had a big impact on my reading experience (for the better). The ‘After Death’ sections are more contemporary comic format, with speech bubbles and lettering but with such a different tone to the main character – Jonah. He’s more disconnected, more singular in his mission. Cold even, but not heartless. The reader is in no doubt that Jonah has a directive, what that is doesn’t become clear until near the end of the comic and I’m not telling you what that is, you need to experience this story for yourself. It’s great to see some Jeff Lemire art back on the main stage, and reading A.D. actually prompted me to look out my Sweet Tooth TPs. Jeff’s art is unique on it’s own, but the added use of Watercolour for effect in illustrating for this title has really taken things to a new level. It is, quite simply, stunning. I am finding it difficult to put into words how much I love the art here. Combined with the narrative – especially when Jonah recalls his past – made my emotional investment into this story increase exponentially. Little touches, like the shadow of the cassette deck where Jeff has let the color run like a tear track as Jonah talks about the first time he stole something… it seems so powerful to me; like a visual representation of his regret. Or they way the tape from the cassette is tangled around Jonah’s mum in her hospital bed – such a powerfully visual symbol (you’ll understand once you read the story). I’m not even going to touch on the stunning two page spreads, but I think you get what I’m saying, the art of A.D is, to coin a phrase, excelsior. After Death is an incredible piece of work by two creators at the absolute top of their game. I’ve read and reviewed some emotionally powerful comics this year, but nothing has come close to the fallout this story has had on me. There is a powerful beauty in the solemnity of Scott’s writing, and a kind of desperate hope that I’m not sure will be realised. This story has all the markings of a poetic tragedy that I am desperate to complete, with some of the most viscerally affective artwork I’ve seen in comics.